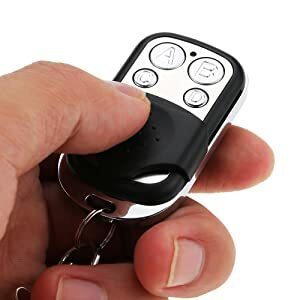 Duplicate Up To 4 Remote Controls In Seconds! Don't worry about privacy and safety. It adopts one-to-one key copy technology and the password of each key is saved individually. Including High transfer sensitivity, no signal blocking. 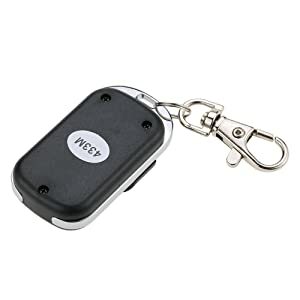 The copy transmitter switch is durable, plus you can take it anywhere easily with key chain design. 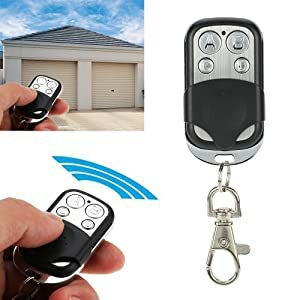 Approach to duplicating: Place them side by side (as close as possible), then press both one key of your old remote and the to-be-matched key on this remote simultaneously. The LED indicator will flash about three times, followed by a continuous fast blinking. The learning process is done. Other keys accordingly. Approach to clearing old codes: Long press the upper two (A & B) buttons to clear old codes (The LED indicator will flash three times, followed by a continuous fast blinking, which is the sign of cleared state). Approach to clearing old codes: Long press the upper two (A & B) buttons to clear old codes (The LED indicator will flash three times, followed by a continuous fast blinking, which is the sign of cleared state.). Compatible chips: 2260（such as PT2260, SC2260, LX2260, HX2260, etc. ); 2262（such as PT2262, SC2262, LX2262, HS2262, HX2262, etc. ), PT2264, PT2240（LX2240), CS5211, 1527(EV1527, HS1527, HX1527), SMC918, AX5026, SMC926, AX5326-3, AX5326-4, HT6010, HT6012, HT6013, HT6014, HT12D, HT46F49E, PIC16F630 (and those compatible with the above chips). Note: It is also applicable if your chip's model is different from the above ones in prefix(letters), for chips from different manufacturers may be different in model prefix. But the number part needs to be identical.